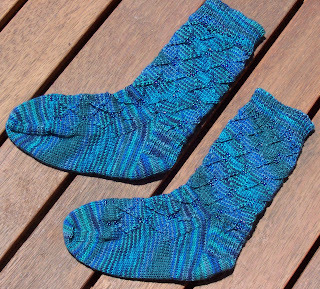 I've completed my first finished object of the new year, which is actually the first Rockin' Sock Club installment of last year. I absolutely love the pattern and the colour of the yarn, and may use this pattern again. This is actually the only installment I knitted from last years club as last year was a very gift/swap heavy year for me. I've made it one of my new years resolutions this year to knit more stuff for me! I'm very happy with these, the only thing I'm disappointed about is the fact that we're in the middle of a heatwave and I'll have to wait until the weather cools down again to wear them! It's the new installment of Knitabulous Indian Summer Club. 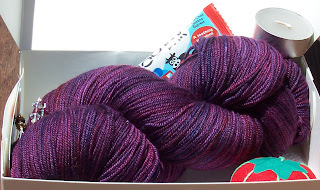 The yarn is 50/50 silk merino in Bollywood Nights, to be knitted up into the Bollywood capelet. As usual, she has included lots of extra goodies as well (edible treat, pincushion, candle and stitchmarkers). I love using her yarn, and the colours she comes up with are gorgeous as well. Can't wait to get started on this one. Only one more gift project to get out of the way, and then finally I can knit something for me!